I had an operation to repair the rotator cuff in my left shoulder in August 2014. There is still an occasional twinge in my left shoulder. Shortly after the operation, the consultant said he could do a hip replacement in less time than it took to repair my shoulder. Only then did I realise it had been a bigger operation than I had ever realised. It was time to visit the shoulder consultant again. About eight weeks after the operation The Wife and I went to a concert at The Roundhouse in London. Getting the bus back to Euston I lifted up the back of my Travelscoot with my left hand and I felt a ping in my left arm. At the time it hurt I did not think much more about it. Is this ‘cos I’m a bloke? Every day I did all the remedial exercises, physiotherapy and hydrotherapy. Slowly I was getting strength back into the shoulder. The only problem was lifting anything with my left arm in one specific way. Imagine the arm hanging down and moving it up to the horizontal as if reaching out to the left. There was almost no strength. I could not lift anything like a book or bottle of wine using that action. I continued to do all the exercises, my shoulder got stronger but this problem would not go away. Eighteen months after the operation I felt brave enough to find out about the problem. I asked my GP to refer me back to the consultant who did the operation. The appointment to visit the shoulder consultant was arranged. We exchanged pleasantries then he asked me to take my shirt off and flex my left bicep. The left bicep popped up, just like Popeye when he flexes his arms. “Umm I’m not surprised” he said, “there is now a complete tear in the tendon from the shoulder to the biceps muscle. 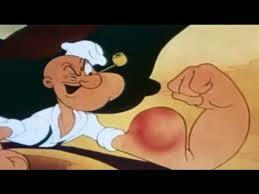 That is why you have a popeye muscle”. He went on to add that he saw the problem when doing the operation but it would have been too complex to repair given the circumstances. The consultant would have been a very good salesman. Keep on eating the spinach Patrick!